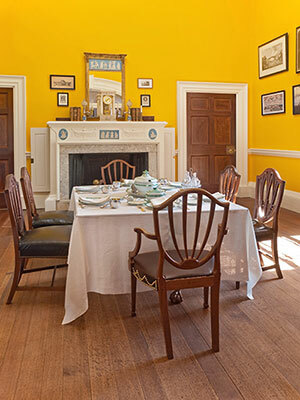 The dining room was the site of two main meals every day: breakfast and dinner. When the double pocket doors to the Tea Room were opened, it could accommodate a large number of diners. Wine dumbwaiters on either side of fireplace brought wine up from the cellar below; a pivoting serving door with shelves enabled slaves to move dishes in and out of the room more easily and with fewer intrusions to diners. The Wedgwood decoration on the fireplace likely does not date to Jefferson's time. Dimensions 18' - 6" x 18' - 0"; ceiling 17' - 9"
Color Originally unpainted plaster, then yellow, then wall-papered; current blue paint dates from 1890.